Tags are used to apply text snippets to a case which can then be used for future searching. Tags allow a user that is NOT a case owner to apply text for his or her later searching. Tags are arranged in a hierarchical manner for easy use. There are three different groups of tags in RadPix, “My Tags”, Group tags, and Global tags. When tags are selected from the main query page, the cases are filtered on the tags. Tags are used in 2 ways. When cases are being created or edited, Group and Global tags can be applied to the case. All public tags associated with a case are visible to all users. If a Group tag is applied to a case, ONLY members of that group can see the tag. 4 Tags are selected in this example, denoted by yellow stars and buttons at top of image. Any public, My Tag, or group tag can be applied to a case by a user in view mode. This allows a user to add information to a case for later use. For instance, consider the situation in which Dr. Johnson sees a case Dr. Smith created. Dr. Johnson can view the case, but he cannot edit it. However, he wants to tag the case for his own later use. View level tags allow him to do this. When he views a case, he can add personal (My Tags) tags to the case that only he can see. If he adds Group tags, other members of the group can see them as well. 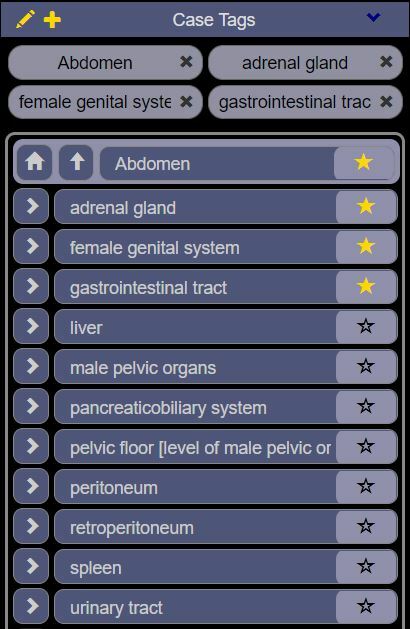 In this example, “abdomen”, “head”, “neck” and “pelvis” have each been added to the case. No user tags have been added. My Tags are created by and only accessible by the individual user. Group tags are created by and only accessible to members of groups of users. For instance, a group of RadPix users that are members of a group “Chest” can make tags and apply tags to cases. Other members of the “Chest” group can then search for cases with the “Chest” tags. 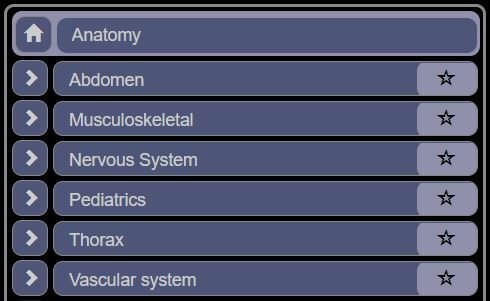 Anatomy tag library showing multiple children. Click the “>” to view children of each entry. Click “star” icon to select tag. 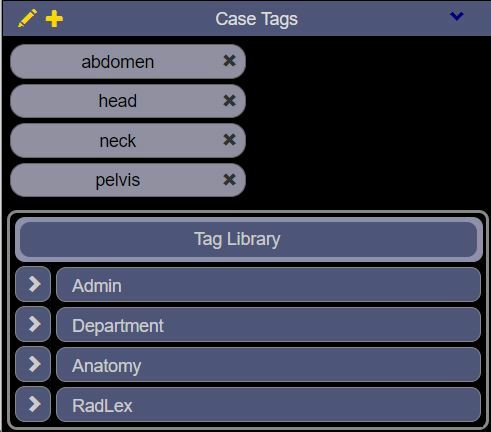 Global tags are available to all users and include RSNA RadLex Anatomical terms. Currently, the RadLex terms are available only in English, with an expected release in Early 2018 of a German translation. A Portuguese version is in the works as well. Clicking the star icon to the right of the item selects the item. Note the stars are yellow for the selected items. In an item has child nodes, there will be a “>” to the left of the tag. The other items do not have any child nodes. For tags that have already been selected, clicking the “x” next to the selected item deselects it. For instance, a case is created by user “johnson” and he sets the read access to the case to all logged in users. User “smith” views the case and wants to use it at an upcoming conference. User “smith” views the case and creates a tag, “CT Conference 2/1/18”. User “smith” tags the case with the new tag and to all the other cases the user wants to show in that conference. In the main query grid, “smith” selects the tag and the displayed list of cases is filtered to only show cases that have been tagged with “CT Conference 2/1/18”. User “johnson” cannot see that user “smith” has tagged the case.